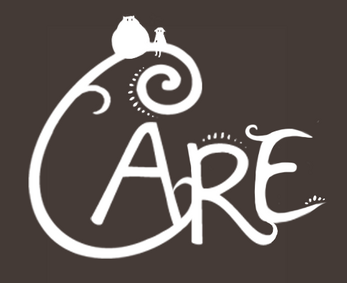 Care is a game made in a two intensive week by thirteen students : 6 Game Artists, 6 Game Designer and 1 Game Programmer. The constraints was to make a polical game (game for change) which had women for target. An other constraint arrive at the end of the frist week : Make a relation between this game and a street path game with vikings. All the project would have to run on a mobile phone and tablet. In this game you embody a little monster who takes care of a big one. You don't know any story or what you have to do in the beginning of the game. Our aim was to let the player discover all the possibilities we put in the game. The main word was Discovery. You can interact with the big character to help him being healthy. There are a lot of interaction and hidden object in the game that you can discovert through experimentation. There are no voice, no text to guide you. You must fend for yourself. Icons are here to help you understanding the big character. When the game is over, don't be sad. Start a new game and enjoy the bonus from your previous game. You move and interact with a tap on the screen. There is no more to know. Enjoy your experimentations.